Untold Casino is an online casino owned and operated by Viral Interactive. It’s a new casino within the iGaming world, having just launched in 2018. With it, comes a sharp look and feel that plays beautifully across both desktop and mobile platforms. While the site doesn’t have the hugest selection of games, it does offer a top-quality live dealer experience that makes this site well worth a visit. Upon entering this online casino, you’ll find yourself quickly surrounded by dark undertones – somewhat of a contrast to many of the razzly-dazzly online casinos on the market. Yet, the dark design is a refreshing change, Steampunk theme and all! Before you sign up with Untold Casino, you should know that the casino does not yet allow players from several counties, including the United States, Russia and Australia. If your location isn’t on the list, be sure to check with local laws to see if it’s okay for you to wager real money at this online casino. While Untold Casino operates a number of white labels, including Aha, Lucky and Red Army Bet under UK Gambling Commission licensing, dispute resolution takes place through the operator or the Malta Gaming Authority. This site’s theme revolves around a good dose of mystery and adventure. Lord Untold is your host for your gambling experience, and you’ll find him popping up in the lobby, the About Us section and even in the promotional narrative. Lord Untold’s voice has been created around the character and the imaginary world from which he hails. You’ll find the character carries across quite well over all the offers to keep your excitement and full throttle when you play at Untold Casino. So, what exactly does this new casino have to offer players? One you sign up and open a new player account with Untold Casino, you can look forward to choosing between four generous offers. The bonuses have been designed to cater to an array of different types of players, so you’ll quickly find something to boost your bankroll. If you want to cash out your rewards, take note that you’ll need to wager your deposit 40x. What’s more, the deal is only available to players in Switzerland, Sweden, Austria, Germany, Finland and Norway. If you decide to deposit $/€100 or more for your first three deposits, the casino will hand over another 127 spins. You’ll need to playthrough 40x in 7 days if you want to withdraw your winnings. The free spins are only available for use on the Boomanji and Kawaii Kitty slots. If you’re a big fan of the whole live dealer experience, there’s a welcome bonus for you, too. Simply deposit the minimum $/€20 and use it within the Live Casino section of Untold Casino. After that, the casino will give you a rather generous 30% of your losses. Again, the bonus is only available on your first 3 deposits and you will only get cashback in your balances is less than $/€1. To cash out your winnings, you’ll need to wager your deposit 40x. The casino has implemented a maximum stake per bet for this one, so you can have fun playing your favourite games with the max bet amount. If you manage to clear the playthrough requirements and your balance is less than 50% up to $/€1, you qualify for the 10% cashback offer. This means you can look forward to up to $/€399 bonus money. To withdraw the amount, you must play through the bonus 20x. It seems that Untold Casino is serious about big rewards. There’s free cash, free spins, cashback and more. The only downside is that you can only choose one welcome offer. 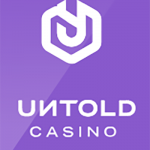 There aren’t any regular promos on offer as yet, but Untold Casino is still young, so let’s hope it’s something they’re working on, preferably with a loyalty programme, too. Untold Casino has made banking easy for players. While options are a little limited compared to more mature online casinos, there’s no doubt this operator will add more options as it grows. One impressive point worth mentioning is that this casino allows you to make instant transactions, other than if you use Paysafecard. What’s more, there’s no additional transaction fees. If you want to cash out your winnings, you’ll need to use the same method as you did for your deposits. The minimum withdrawal amount is just $/€20 and the maximum is $/€25,000 per month. Should you choose to withdraw $/€2,000 or more, the casino will perform certain security checks. If you choose to cashout via Paysafecard, the casino deducts a 9% transaction fee from the requested amount. All withdrawals take just 24 hours to process. Untold Casino is powered by some of the biggest iGaming software developers, including Netent, Microgaming, Evolution Gaming, Genesis Gaming, Betsoft, Pragmatic Play and a few others. At this casino, you’ll find some of the most popular casino games around, like Gonzo’s Quest, Fortune Multiplier, Legend of Cleopatra, Aztec Warrior Princess, Starburst, Fruiterra and many more. There are more than 1,800 slots to choose from, so if you’re fanatical about slots, you’re sure to fall in love with Untold Casino right away – and all those free spins, too! There’s also an assortment of video slots and table games to add to the choice of games that suit both experienced and more recreational gamblers. Not only are there the usual 3-reel and 5-reel slots, there are progressive jackpots, and popular table games to boot – most of which you can try in free mode first before wagering your real cash to win real prizes. Untold Casino has a well populated live dealer suite with dozens of games. Mostly, you’ll find roulette, baccarat and blackjack courtesy of Evolution Gaming. There’s also a practice mode from Ezugi Live Casino that let’s you hone your skills without risking your cash. For something completely different, this casino lets you choose to play baccarat on the floor of Queenco in Cambodia for a truly international real-time experience. While Untold Casino does not yet have a dedicated mobile app, players who like to gamble on the go can access the instant play lobby from your device’s internet browser. Whether you play of laptop, tablet or smartphone, you can enjoy the same high-quality experience you do on your desktop PC. All the live games are streamed in HTML 5, too, for speedy loading and seamless transition from one game to the next. You can also access some of the table games and slots in demo mode via your mobile device. A controlled online casino environment is sure to be a safe one. When you play on a licensed casino site, you can rest assured your personal and banking data is safe and rather focus on the fun. Untold Casino holds licenses from the Government of Curacao, the Malta Gaming Authority and the UK Gambling Commission. What’s more, it uses 128-bit SSL encryption software to scramble your personal data and keep your completely safe from third parties and underhanded people. Untold Casino also has a dedicated page for responsible gambling. Here, you’ll find information on how to fight addictive behaviours and the casino has several limits in place that you can implement if you need to, including self-exclusion. Untold Casino has an excellent FAQ section that deals with the most common player concerns. If you do run into any issues, though, you can contact the helpful customer support team using the website’s contact form. The response time seems to be 24 hours. The site does not yet have telephonic support or live chat, but let’s hope they add it soon. Untold Casino is brand new. Yet, it’s quickly showing us that it plans to become a force to be reckoned with in the industry. The site has more than 1,000 titles from some of the biggest and best gaming providers. There’s also an array of very generous welcome bonuses that cater to all sorts of players and bankrolls. Sure, Untold Casino is lacking in banking options and there’s no handy live chat or phone support, but remember this casino is still young and we have no doubt they will add these, hopefully along with more promotions and a loyalty programme as their player base grows. All that’s left to do if try out Untold Casino, pick a nifty welcome bonus and have tons of fun on the best slots and table games around – not to mention the seamless and exceptional-quality live dealer games!